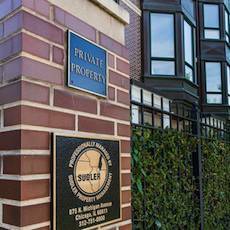 Since 1927, Sudler has had one goal: to be Chicago’s best and most innovative property management firm. More than 100 homeowner associations (representing approximately 20,000 residential units) trust us to provide industry-leading programs and services tailored to meet each property’s unique needs. We focus on maintaining strong, long-term client relationships. Some associations have been with Sudler since the beginning. The John Hancock building is our flagship property! This building was built in 1969 as apartments and was converted to condominiums in 1973. This year marks the 33rd anniversary. There are 100 stories in the building. The residential floors are floors 44 through 92 (the 44th floor consisting of common elements). There are a total of 705 condominium units and an approximate resident population of 1,450. This is a full service building featuring 24 hour doormen and maintenance personnel. Amenities include a beautiful indoor pool, 2 workout rooms, 2 hospitality rooms, receiving room, valet shop, market, restaurants, garage parking (monthly fee charged), electronic security. There is an on-site management office and the best views in the city! 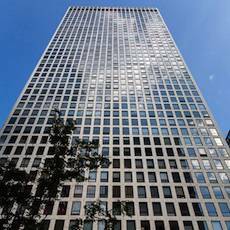 Designed by the architectural firm of Lowenberg and Lowenberg and built in 1969, 1700 is the tallest building south of the Loop. 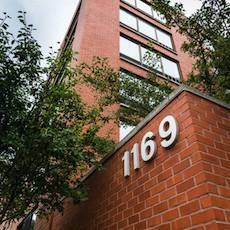 1700 converted from rental apartments to condominiums in 1994 and was the largest Hyde Park condominium conversion at that time. The building consists of 369 units, with studio, one, two and three-bedroom condominiums. Many of the units offer breathtaking views of the Chicago lakefront, Jackson Park and the Museum of Science and Industry. 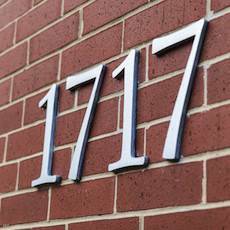 1700 is a favorite among neighborhood locals in Hyde Park. The building offers many amenities including 24/7 door staff, onsite assistant engineer, exercise room and sundeck. 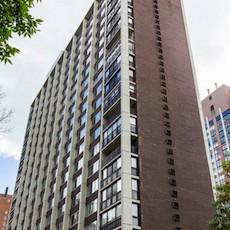 1515 North Astor was constructed in 1969 and is located in the heart of Chicago’s prestigious Gold Coast neighborhood, located walking distance from Lincoln Park. The building has a wide range of amenities including a pool, hospitality room, bike storage, 24 hour door staff and fitness center. The valet garage is available for all owners and their guests. 1515 North Astor is a pet friendly building, so all your cats and dogs are welcomed with open arms. 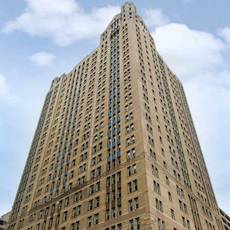 Astor-Banks Condominium Association, located at 1325 North Astor Street, is a 14 story vintage building of 12 units. This Gold Coast gem employs full-time door staff and a live-in building engineer to service the needs of its owners. An attached, fully enclosed garage provides parking for 14 vehicles, which in the Gold Coast is a real plus. A short walk down tree-lined streets takes you to Michigan Avenue shopping and restaurants. 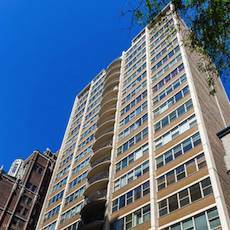 This beautiful 21-story building built as a condominium in 1972 is located on the most attractive and prestigious street in the city of Chicago - Astor Street! This quiet community has three spacious apartments on each floor and a penthouse, each with wonderful views. Amenities include a roof top deck, indoor parking, 24-hour door staff, washer and dryer in unit, a hospitality room, storage lockers and bicycle storage. 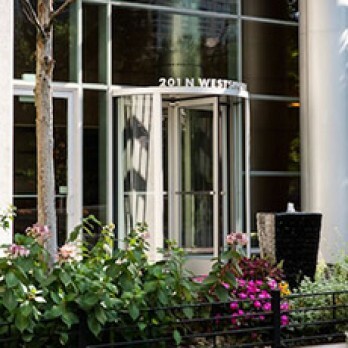 Astor Villa residents are within walking distance from the Magnificent Mile, restaurants, major department and specialty stores, and entertainment. Oak Street Beach is also nearby. 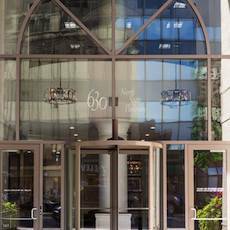 50 East Bellevue is located in Chicago’s premier Gold Coast neighborhood. Standing twenty-seven stories tall with 124 units, 50 East Bellevue is in close proximity to Chicago’s lakefront and exclusive shopping retailers such as Bloomingdales, Water Tower Place as well as Chicago’s best restaurants. 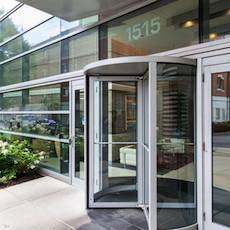 The building amenities include a 24-hour doorman exercise facility with a whirlpool and sauna, indoor garage parking and roof top deck with amazing city views. The building boasts that it has one of the most attractive landscapes plantings in the area every year which fits perfectly with the neighboring brownstones and tree lined streets. 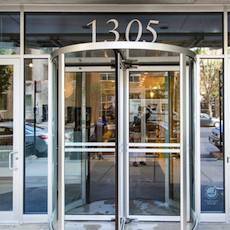 40 East Cedar is located in one of the most popular neighborhoods in Chicago. 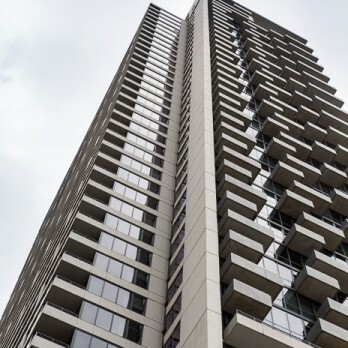 The 23 story, 75 unit residential high-rise in the Gold Coast offers spacious condominiums in a stylish and luxurious setting with rental parking available for residents' vehicles. 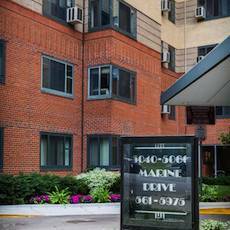 Walk to Lake Michigan, Mag Mile, numerous restaurants and easy access to all public transportation add to the appeal of this location. An onsite management office, live-in engineer and fitness room are just some of the additional amenities. Constructed in 1926, the 70 East Cedar Street Building was converted to a cooperative in 1949. There are 30 apartments in the building. The two typical floor plans are for 9 or 10 room apartments, each including two or three bedrooms, three bathrooms and staff quarters. On the four top floors, there are four duplex penthouse apartments each with a terrace outside the principal main floor room. There is a working fireplace in each of 28 of the apartments. The building includes a garage for 17 cars. Car washing service by building staff is included in the monthly garage fee. The building engineer resides on the premises. The 24-hour staff provides full receiving room service. 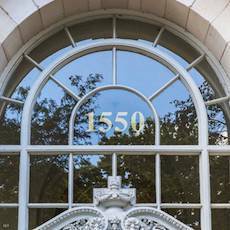 The building is a quietly elegant haven just off North Lake Shore Drive (1100 north). 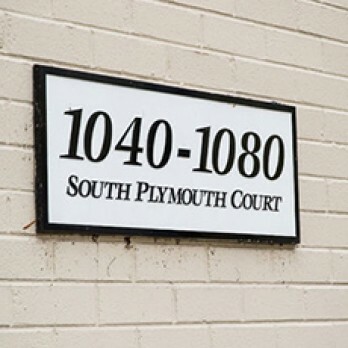 111 East Chestnut is a 444 unit full service condominium property. Less than a minute walk from Chicago's Magnificent Mile, 111 East Chestnut's Streeterville location enables residents the benefit of spectacular Lake Michigan and Michigan Avenue views. Amenities include an exercise room, an outdoor swimming pool, bicycle room, storage rooms, hospitality room, receiving room, laundry room, and 24 hour door staff. Shopping, great restaurants, Lake Michigan, and convenience make 111 East Chestnut one of the best locations to live in Chicago. Plaza on DeWitt is a 407 unit full service condominium property. Less than a minute's walk from Chicago's Magnificent Mile, Plaza on DeWitt's Streeterville location enables residents the benefit of spectacular Lake Michigan and Michigan Avenue views. Amenities include a new state-of-the-art exercise room, an outdoor swimming pool, bicycle room, storage rooms, hospitality room, receiving room, laundry room, and 24 hour door staff. Garage parking is available in this dog friendly building. Recent projects include rehabilitated elevators, a renovated hospitality room, a new membrane on the pool deck, renovated lobby and hallway, and a world-class fitness center. Shopping, great restaurants, Lake Michigan, and convenience make Plaza on DeWitt one of the best locations to live in Chicago. Completed in 1989, the 39 story building also includes six-levels of above grade parking and a ground floor that consists of a combination of commercial space and building offices. Other amenities include a 24 hour doorman, heated outdoor swimming pool & sundeck, party room, exercise room, laundry room, bike storage racks and storage lockers. The building is also fully equipped with both smoke detectors and fire sprinklers. 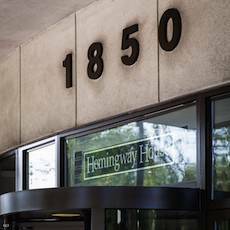 The Hemingway House Condominium Association overlooking the Lincoln Park Zoo has the best of both Old Town and Lincoln Park neighborhoods. The wonderful zoo, city, and Lake Michigan views can't be beat! The Hemingway House was built as rental in 1969 and converted to condominiums in 1979. There are ten units per floor, 280 units total consisting of studios, one and two bedroom units. The building amenities include a well known 24 hour door staff, a large heated outdoor pool, sundeck and gas grill, party room, heated parking garage with 24 hour parking attendant (rental fees apply), 24 hour laundry room with the Smart-Card debit system, storage and a 24 hour receiving room. 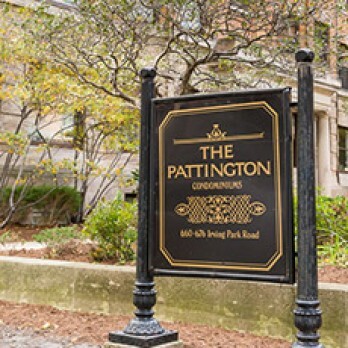 Constructed in 2000-2001, this spectacular 162-unit condominium property is located in one of the most desirable locations in the City of Chicago. Amenities include an indoor parking facility, valet shop, on-site management office, 24-hour door staff, in-unit washers and dryers, an exercise room, hospitality room, bicycle storage, and storage lockers. Restaurants, theater, nightclubs, Chicago's Magnificent Mile, and Lake Michigan are only a stone's throw from this exciting address. This is the place to live, work and play. The incomparable location at Grand and Dearborn in Chicago, Illinois, with world-class retailers down the street and an entire floor of 5-star amenities, including an outdoor pool, saunas, club-quality fitness center, and much more! This beautiful and much sought after and admired condominum consists of 284 luxury residences. 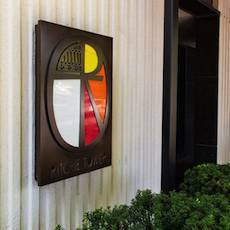 Located on a tree-lined street in the heart of the Gold Coast, 1155 N. Dearborn is a newly constructed, modern art deco style building. The 39 luxurious residences range in size from 1,900 to over 3,000 square feet. Indoor parking, 24 hour door staff and a complete fitness facility are some of the amenities in this "pet friendly" environment. 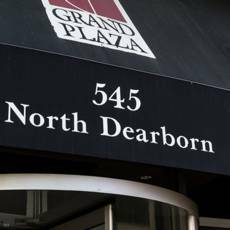 Only steps from restaurants, entertainment, shopping on both Oak Street and Michigan Avenue, and two blocks from the Lake, make The Dearborn-Elm Condominium a most desirous place to reside. 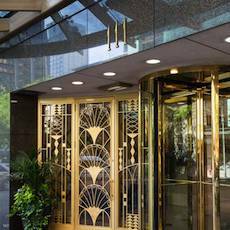 Built in 1926 and rising fourteen stories in Chicago’s beautiful Gold Coast, is the vintage 1366 North Dearborn Parkway building. The brick and cut stone exterior invokes Italian Renaissance palazzo features, particularly its three story stone base and roof top balustrade. The lobby consists of elaborate marble, walnut, and ornamental plaster finishes. The building’s proximity to Lake Michigan, public transportation, restaurants and entertainment truly put all that Chicago has to offer at your fingertips. This condominium was built in 1974 and consists of 96 units in a 28-story building ranging from one to two bedroom units. Amenities include full time on-site engineer, 16-hour doormen 7 days per week, maintenance staff, sundeck, pool, laundry room, party room, bike storage area, cable TV, storage lockers and 24/7 indoor and outdoor valet parking. 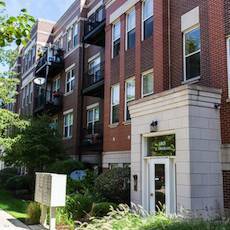 Located in the Gold Coast and is within walking distance to Lincoln Park Zoo, Lake Michigan and Lincoln Park Zoo. 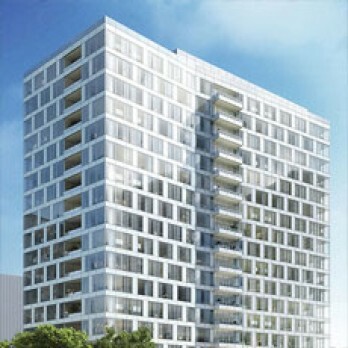 Designed by Lucien Lagrange and built in 2009, 10 East Delaware is one of the Gold Coast’s most exciting developments. It consists of 115 private residences, each featuring a curving private balcony with wrought iron detailing. Amenities include the 24-hours staffed front desk, a large fitness center, an outdoor rooftop pool and a private dining room, the Ten Club. 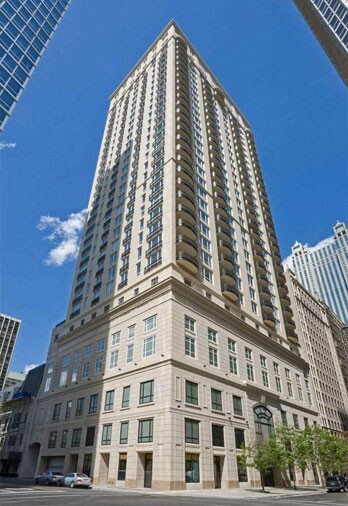 Located just east of Michigan Avenue in the Gold Coast, 253 E. Delaware is a 23 story high-rise consisting of 164 units and 92 parking spaces. 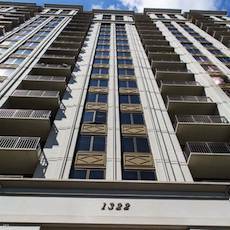 Constructed in 1957 and converted to condominiums in 1981, the building is in the perfect location for access to all the fine shopping and dining in the area while maintaining a warm, residential feel. 24 hour door staff, a receiving room, a large sundeck and hospitality room are but a few of the features the building has to offer. This vintage high rise was built in 1912 and houses 106 spacious condos within its nine stories. Consisting of three connected buildings, this Robert DeGolyer designed building is known as The Marlborough. 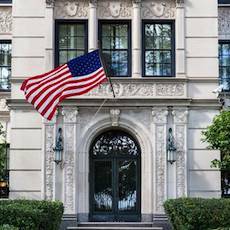 Robert DeGolyer is known for having designed luxury apartment buildings in the early 1900s along Chicago’s lakefront from the Gold Coast to the northern boundaries of Lincoln Park. 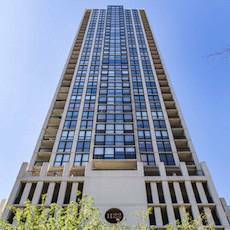 5000 East End Avenue is a 98 unit, 28-story elegant vintage high rise condominium built in the late 1920's. The neo-Gothic prewar high-rise was the tallest building on the South Side until 1965. It is in the Indian Village district and is considered part of the Hyde Park neighborhood. It was converted from a co-op in 2011. Building has 24-hour doorman, daytime concierge, fitness room, storage, bike room, laundry room and onsite manager. The Renaissance Place Condominium Association is a 6-story 204 unit loft building, converted in 1998, that was once the Chicago Osteopathic Hospital. Building amenities include exercise room, bike and party rooms. 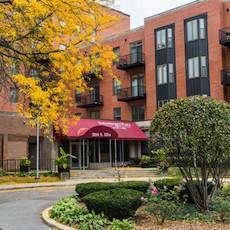 Situated in the historic Hyde Park, it is close to the lakefront, University of Chicago and everything historic Hyde Park has to offer. 73 E. Elm is a beautiful vintage condominium property consisting of 48 units. The Building features a 24/7 door staff, laundry facilities, roof deck and one of the best locations in the Gold Coast. 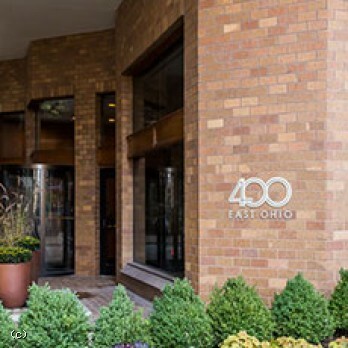 Located just steps away from Michigan Avenue, the Two East Erie Street Condominium Association soars 40 stories with 253 units offering panoramic views of the city, first class amenities, and unsurpassed customer service. This building was constructed in 2002 and converted to condominiums in 2005. Amenities include 24 hour door staff, friendly on-site management team, sundeck, fitness room, hospitality room, bike room, indoor deeded parking, deeded storage lockers, and the association is pet friendly. Located in the heart of Chicago's world renowned shopping, restaurant, and entertainment venues, Two East Erie is an enviable home address. The 55 East Erie Condominium Association was built in 2004 as condominiums. The 194 residential units, on 56 floors, include four "Skyhomes" (four story townhomes), seven floors of split floor penthouse homes, and a full unit top floor penthouse; all with express service elevators. Just steps off of Chicago's famed Michigan Avenue, this new jewel in Chicago's skyline boasts breathtaking views of Lake Michigan, Chicago's North Shore, and the downtown area. 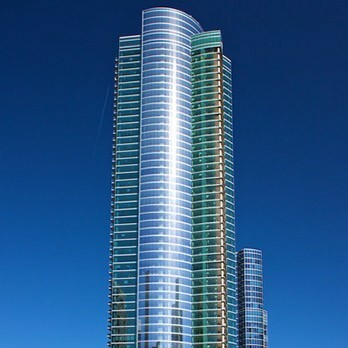 55 East Erie is the tallest all-residential tower in Chicago, the second tallest all-residential tower in the Western-Hemisphere, and the 33rd tallest all-residential building in the world. 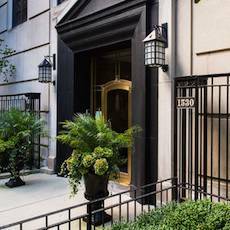 Located in Chicago's "Mansion Row" District, this unique property offers deeded parking, a lap-pool, Jacuzzi, men's and women's locker rooms with private lockers, showers, and saunas, two loading docks, an on-site drycleaner, private parking lot elevators, an on-site professional management team, 24-hour door staff, on-site engineering staff, and janitorial staff, a 12th floor sky promenade, two hospitality rooms with a full kitchen, bicycle storage, and state of the art security. It's also a pet-friendly building. All in all, 55 East Eire a clear choice for those who want the best. The Prairie Single Family Homes community was built in 1992 and is located in Dearborn Park II of the South Loop and consists of 40 single family homes. From each home you are in walking distance to many fine restaurants, museums, the Shedd Aquarium, the Adler Planetarium & Astronomy Museum, Grant Park and the new Millennium Park. 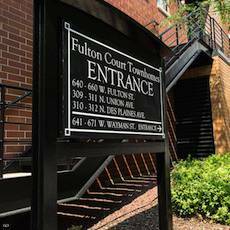 The Fulton Court Condominium Association, located in a growing community made up of several distinct neighborhoods, consists of 48 luxury townhome units with indoor parking. The beautifully landscaped private courtyard areas enhance the distinct architectural design made to provide a relaxing environment for the urban resident. 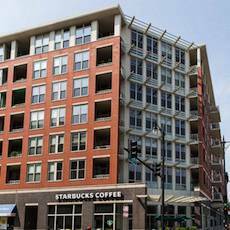 This community offers access to several distinct neighborhoods, such as Greek Town, Chicago West Loop, and Downtown. The Fulton River District includes world-class restaurants, clubs and a burgeoning gallery scene. 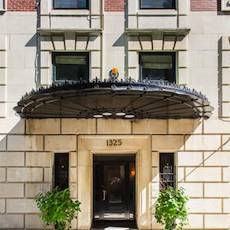 Beekman Place Homeowners Association is located at 55 West Goethe in the heart of Chicago’s premier Gold Coast neighborhood. Beekman Place is a sub-division comprised of 42 residential units constructed in 1985 and completed in 1989. Just minutes from Chicago’s Oak Street Beach, restaurants and nightlife, Beekman Place offers intimate luxury living with spacious two and three bedroom units with two car garages. Amenities include a 24 hour attendant at the guard house, gated community, private patios, and a dog friendly environment. 416 West Grant Place is a unique 10 unit townhome association set on a beautiful tree-lined street in the heart of Lincoln Park. The townhomes feature three levels of charming living space surrounded by a lush courtyard full of meticulously maintained vegetation. The design of the townhomes incorporates the use of the floor to ceiling windows in conjunction with open floor plans to provide for fireplaces, private decks, individual garages and generous living spaces. Built in the early 1900's for industrial use 400 S. Green was converted to 52 residential condominiums in the mid-1980's. As a true loft building, the condominiums feature spacious open floor plans, exposed wood, timber ceilings, exposed brick, 15 foot ceiling heights, multi -level living spaces, floor to ceiling windows and a freight elevator large enough to fit a small automobile. Located in the West Loop on the corner of Green and Van Buren, Green Street residents enjoy a close proximity to the Loop, Greek Town, Little Italy and University of Illinois Chicago Campus. 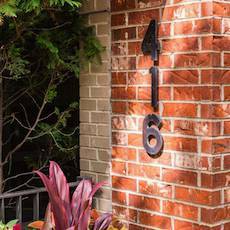 Standing quietly in Lincoln Park since 1965, the Hampden Green Condominium Association is the best-kept secret along Lake Michigan. Originally developed as apartments, the property converted to condominiums in 1975. The 205 units have east or west exposures. The hallways were recently re-carpeted and the lobby has been updated. An electronic entry/security FOB system is in place. On-site parking, roof-top pool, laundry room, bike room, saunas, receiving room, hospitality room, on-site management and sweeping views of Lake Michigan and the City make this an enviable property. This great property is located on a peaceful, tree-lined street of historic mansions, grand lawns and wrought-iron gates meets the quiet stretch of inner Lake Shore Drive opposite Belmont Harbor. 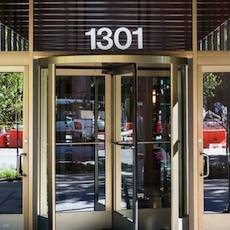 Here, at Lakeview's newest luxury condominiums, a canopied street entrance welcomes you to a newly remodeled marble lobby, where a 24-hour doorman waits at your service. A few floors up, a fitness center opens to an enormous rooftop pool and sundeck... sparkling water and chaise lounges are reminiscent of an exclusive resort. The residences themselves are uncommonly private - only eight per floor, each graced with standard features that, in other buildings, would be called 'upgrades.' Real hardwood flooring... over-sized bedrooms... granite gourmet kitchens... designer cabinets... Whirlpool appliances... custom-designed baths are standard features of these beautiful homes. Spacious great rooms feature over-sized bay windows, offering views of the lake, harbor, skyline, and surrounding Lakeview community... where a legendary, eclectic blend of theaters, restaurants, shops and people await, footsteps away. 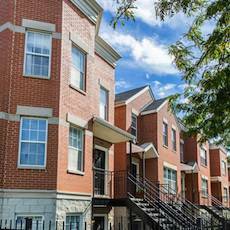 The Park Row at Burnham Place Homeowners Association is a prestigious grouping of 69 Townhomes in one of Chicago's premier neighborhoods. Plush landscaping surrounds this gated community adding to the serenity of the location. Easy access to Lake Shore Drive and downtown is another amenity this neighborhood has to offer. Centrally located in the 'Jackson Loft Corridor District', at the corner of Jackson Boulevard and Des Plaines Avenue. 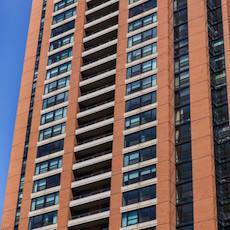 Capitol Hill Lofts is minutes from Greektown, Metra & Union Stations and all major highways. Capitol Hill Lofts is a 90-unit loft condominium recently converted in 2001 and built in the 1920's - The complex has housed a printing company, a light manufacturer, Uneeda Vacuum Company, as well as several restaurants. Amenities include: In-Unit washers and dryers, balconies, exercise room, bike room, storage lockers, indoor & outdoor parking. The building also houses a White Hen Pantry, a hair and nail salon, a chiropractor and Dry Cleaners. Haberdasher Square Lofts is a 226 unit loft condominium with deeded parking. Built in the early 1920's, these (2) buildings were once a bomb shelter and more recently they housed a clothed manufacturer (Hart Schafner and Marx). The property boasts unusual and dynamic lofts in the trendy West Loop area. Some units have balconies, some have patios, and some have roof rights. Amenities include: in-unit washers and dryers, hospitality room, indoor basketball court, dry-cleaners on site, and a rooftop deck. There is a 24 hour door staff, on-site management office and no pet restrictions. Long revered as one of the world's most sought after addresses, the Drake Tower majestically stands on East Lake Shore Drive overlooking Oak Street Beach. 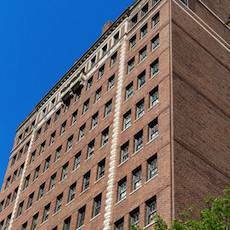 Built in 1929 and designed by legendary architect Benjamin Marshall, the Drake Tower Apartments adjoins the famed Drake Hotel on East Lake Shore Drive, in what is acknowledged to be one of the finest residential sections in the world. The location is within walking distance to the most superb restaurants, shopping and amusements. The thirty story building contains 68 homes of three to nine rooms and some of the city's finest views of Lake Michigan. 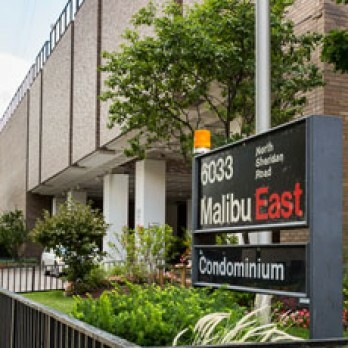 In addition to the renowned address and location, the full service building offers 24 hour doorman, security and elevator operators, on-site engineer and building manager, a well equipped business center, wine cellar, a state of the art fitness center, rotating circular driveway for easy loading and unloading of luggage and parcels, and bicycle storage. The impeccably appointed lobby provides smooth access to the valet garage which provides ample resident and guest parking. 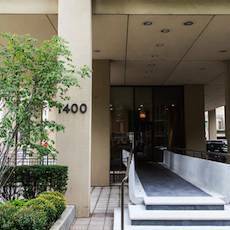 The building features all of the services offered by the Drake Hotel, which is accessible through a private interior entrance, available only to Drake Tower residents. 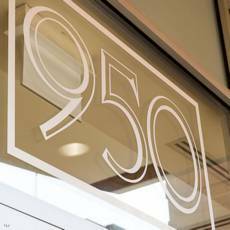 680 North Lake Shore Drive - a part of Chicago's history! In 1923 construction began for the American Furniture Mart (whose address at that time was 666 Lake Shore Drive) which was then known as the "world's largest building". In 1951, General Lawrence H. Whiting, the original owner of the building, sold it to Consolidated Enterprises, Inc. and Arthur Wirtz became president of the American Furniture Mart. In 1959 the American Furniture Mart still attracted a crowd; however, in the 60's the focus of the trade shifted to Texas and North Carolina. In 1979, David Paul and Peter Immelman (whom Mr. Paul bought out in 1980) bought the building from the Wirtz Company. Most of the building was gutted and Mr. Paul installed a garage, and put in brand new plumbing and heating systems readying the property for the sale of condominiums. 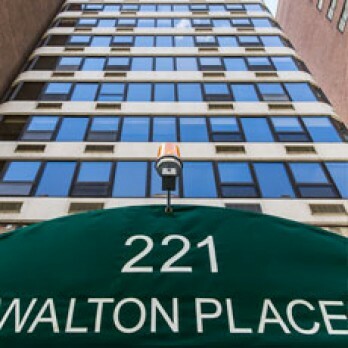 This was not a good time for sales because the prime rate hit 21%, so the building remained rental. In 1982, Chemical Bank of New York purchased the building and readied the South Residences (120 apartments). The Tower Residences (131 apartments) was owned by Gerald Richman and he converted the Tower Residences to condominiums in 1990. 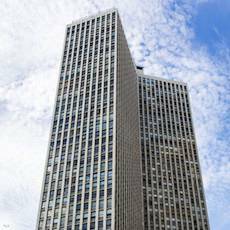 In March, 1988 the building's name was officially changed to 680 North Lake Shore Drive. The property is approximately two million square feet comprised of 600,000 square feet of offices, commercial stores, a public garage and three Condominium Associations housing 415 condominiums plus a Garage Association with 176 parking spaces. This dignified luxury condominium building offers the residents a city within itself. This pet friendly building offers an expansive health club facility including a lap pool. 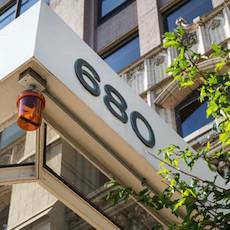 Residents of 680 never need to leave the confines of the building. Restaurants, super market, coffee shop, salons, ACE Hardware, 5/3rd Bank, Walgreens and many other shops to purchase items and pamper yourself are under one roof...not to mention doctor's offices and additional professional places of work! 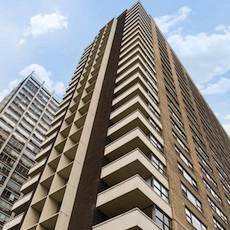 Built in 1957, this 247 unit Gold Coast condominium property is located in one of Chicago's most desirable locations along the lakefront. Stunning views, 24-hour door staff, on-site management office, hospitality room, indoor parking. Constructed in 1928, this vintage cooperative is surpassed by none in terms of quality of construction and service. Lovely garden areas, central security and safety systems in every apartment, indoor valet garage, 24-hour door and maintenance staff, receiving room, and an on-site manager. Elegance, views, location, service make this one of the country's most desirable address. A beautiful 24-hour full service building overlooking scenic Belmont Harbor and Lake Michigan. 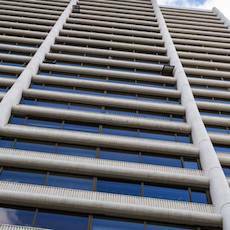 Harbor House is 29 stories high, built in 1965 and converted to condominium residences in 1976. 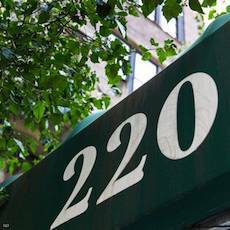 These 278 units are home to approximately 800 residents. Competitive assessments make Harbor House a prime Lakeview property. Building amenities include: free indoor swimming pool and expansive sundeck, free health club quality exercise facility, garage parking (monthly fee), electronic security, valet and package receiving, cable television, broadband Internet service (via cable with a monthly fee). Pets are permissible, two per unit. Dogs shall be limited to the size and type that can comfortably be carried by an average adult. Onsite Management Office. 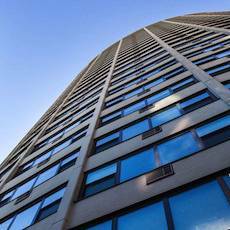 A wonderful, 24 hour, full service building overlooking Lincoln Park, 2626 Lakeview is 42 stories high. It was built in 1968 and converted to condos in 1976. The 491 units are homes to 1,100 residents. 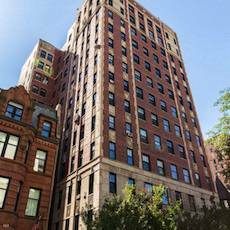 Low monthly assessments, compared to neighboring properties, make a prime Lincoln Park building. Building amenities include: rooftop heated pool and two sundecks with gas bar-b-que grills, newly decorated lobby, exercise room, garage (monthly fee charged by Association), new elevators, valet, electronic security. Dogs are permitted, one per unit, under 30 pounds. Onsite management office. 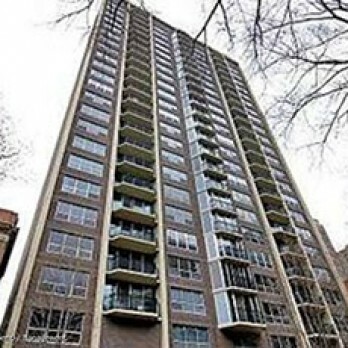 2650 Lakeview is a 397-unit full service high rise building that overlooks Lincoln Park. 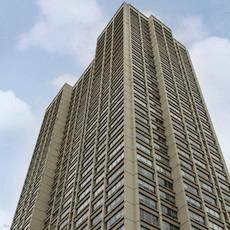 This 44-story building was built in 1972 and converted to condominium residences December 18, 1979. The on-site management team excels in customer service and the 24 hour door staff is friendly and efficient. Add in the professional maintenance team and you have a complete equation of a dedicated team! Competitive assessments and exceptional amenities make 2650 Lakeview a very desirable Lincoln Park residence. Amenities include a mini-mart, valet, indoor pool, complete fitness center, 3 sundecks, tennis courts, indoor garage, storage lockers, and a hospitality room with a panoramic view of the "Mag Mile" and Lake Michigan. 2650 Lakeview does not allow pets and is a non-smoking building. 1001 Madison is located in the historic Westgate Mill area and is a 90-unit condominium building utilizing strong urban planning and street edge design. In 2003, it was awarded Residential Development of the Year by Chicago's West Central Association. The concrete structure is enclosed by a natural brick and glass facade with recessed balconies. The street level features a landscaped sidewalk plaza and houses three retail shops: Starbucks, Blockbuster and Pockets. In addition, there is a 125-car parking garage and retail parking – 1001 Madison has a distinctive lobby which accesses six floors. Easy access to highways, restaurants, sporting events and the downtown area make this the ideal location for City living. Shoreline Park is comprised of two buildings located at 4920 North Marine Drive and 4950-4980 North Marine Drive in the Margate neighborhood. 4920 is a five story brick building with a total of 58 units (57 one bedroom and 1 studio). 4950-4980 is a fourteen story brick building with a total of 512 units (456 one bedroom and 56 two bedroom). There are also deeded parking spaces available (a total of 357 spaces, some indoor and some outdoor). Major common area renovations completed at the time of conversion in 2002 include redecoration of all corridors and lobbies, a complete exercise room, laundry room and state-of-the-art business center. 5040-60 North Marine Drive has 203 units, located in six conjoined buildings. Situated in Margate Park and just a block from Foster Avenue Beach, it is also directly across from the northern section of Lincoln Park offering many opportunities for outdoor activities. The property sits on spacious landscaped grounds and has an adjacent gated parking lot. This historically important building was constructed on Marine Drive in 1939 and was the first all-electric building in Chicago. The original architectural plans are archived in the Chicago History Museum. The building is abundant in art deco treasures and among its many unique features includes a large interior courtyard with an Art Deco fountain and decorative pool. Efforts have been made to preserve the integrity of the original designs and period ambiance whenever possible. The location is easily accessible by public transportation with a bus stop at the front of the property and two blocks from the L Red Line. Sudler Property Management is proud to have been named as the Managing Agent for this spectacular property. 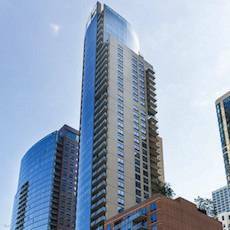 The Residences at River East Center in Streeterville is a 58 story condominium with over 600 homes. Located between Michigan Avenue and Navy Pier, our residential tower has an aura of urban sophistication and convenience. The orientation of the tower is 45 degrees from the street providing elegant lake and city views from all units. The complex contains a hotel, movie theatre, health club, restaurants, retail outlets, and underground parking facility. 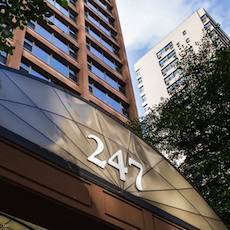 The 777 N. Michigan Avenue Condominium Association is a 40 story high rise building, perfectly situated along the highly desirable Magnificent Mile, at the corner of Chicago and Michigan Avenues. This reinforced concrete structure was originally developed as an apartment building in 1964, and was converted to condominiums in 1977. 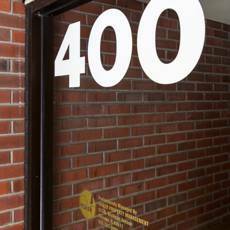 The association consists of 330 residential units, and contains three passenger and one freight elevator. The building's amenities include 24 hour door staff, receiving room, laundry room, sundeck, outdoor pool, hospitality room, storage lockers, bicycle room, and valet parking. You would be hard pressed to find a better location in all of Chicago. This magnificent tower sits above the Park Hyatt Hotel. 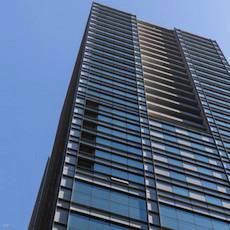 The condominium consists of 48 stories (beginning on the 20th floor). 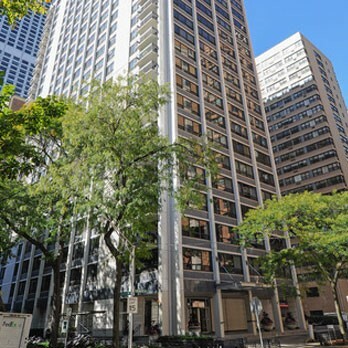 Built in 2000, 800 North Michigan is one of Chicago's most prestigious properties and is located in the most desirable location in the city on Chicago's Magnificent Mile. 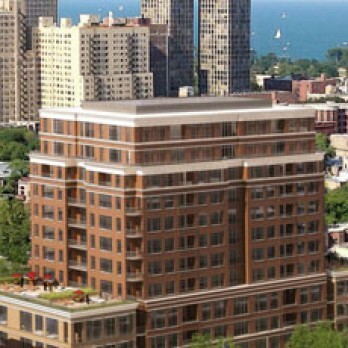 The conversion of the historic building at 310 South Michigan Avenue to luxury residential condominiums is underway. 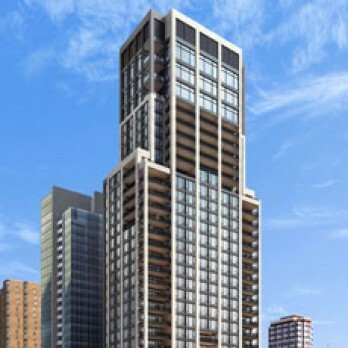 The project will be known as the Metropolitan Tower Condominium Association and is expected to offer 220 one, two, and three bedroom luxury homes, a full floor penthouse with 360-degree vistas, and two-story town homes. Homes will feature richly finished spacious floor plans, and protected views of Grant Park and Lake Michigan. Amenities will include heated indoor parking, furnished guest suites, a fitness center, 24-hour doormen and on-site property management. The building's distinctive and historic blue beehive top light will naturally remain in place. 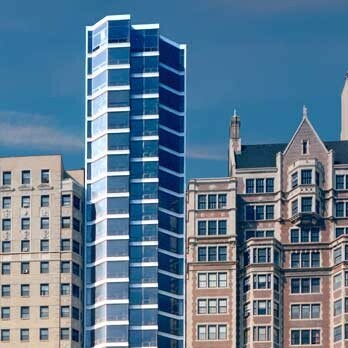 The Columbian is a 46-story condominium tower rising over Grant Park on South Michigan Avenue. The brick clad exterior makes this the tallest hand laid masonry building in the City of Chicago. Designed by De Stefano and Partners the project consists of 220 luxury units with spectacular views of the South Loop including Museum Campus, Soldier Field and the sprawling Grant Park to mention a few. 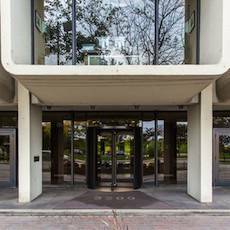 The location is within walking distance to several cultural attractions such as Northerly Island, Symphony Center, Art Institute of Chicago and minutes away from the Loop's Theater District. Building amenities include seven floors of parking, a fitness center, a rooftop garden, sundeck and business center. 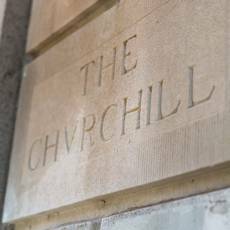 A 24-hour door staff and exquisite finishes in the lobby and common areas give this building a unique character that residents expect for this location. Lofts at Museum Park provide everything the City has to offer at your fingertips. This architecturally stunning 202 unit condominium building nestled in the vibrant South Loop neighborhood has sweeping views of Lake Michigan, Museum Campus, and Soldier Field. Enjoy a walk through the beautiful and lush Grant Park while gazing at the world famous Chicago Skyline. Proximity to public transportation, top rated restaurants, and other amenities such as an on-site Property Manager, 24-hour door staff, indoor parking, and a fitness room make the Lofts at Museum Park a wonderful and truly unique place to call home. The Legacy at Millennium Park is a 72 story condominium tower (one of the tallest in Chicago) located in the Loop at 60 E. Monroe St. The slender modern tower is home to 355 residential units (one to four bedroom residences ranging from 975 to 4,300 sq. ft.) that have panoramic and dramatic views of Chicago’s enviable skyline, Millennium Park, Grant Park and Lake Michigan. Amenities in this pet friendly building include multiple sky-parks, a landscaped sundeck, private function spaces, first class fitness center, balconies, heated indoor pool, whirlpool, deeded parking, on-site management team, 24/7 door staff and on-site valet/dry cleaner. The historic terracotta façade from the Jewelers Row District was preserved as part of construction. The property houses classrooms for the School of the Art Institute of Chicago. The building is adjacent to the University Club of Chicago; Legacy residents who are members of the Club access via private glass sky-bridge. This fashionable highrise consists of 180 residences in the Streeterville neighborhood and is one of the most desirable places to live in Chicago. This well-maintained high-rise Chicago condo building offers an indoor pool and fitness center, along with a sundeck, valet and free guest parking and some of the best views that can be found in all of Chicago. Old Town Village East Mid-rise Condominium is part of the Old Town Village East. It is a mid-rise residence with six stories overlooking some of Chicago's prime real estate. There is heated private parking; great transportation and Old Town Square Shopping Center - your own Dominick's, Blockbuster; Starbucks and more just steps away. 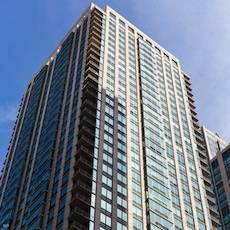 The Private Residences at Ontario Place Condominium Association located at 10 East Ontario is situated in the hub of one of the most enviable locations in Chicago, River North. Right outside of Ontario Place's door you will find excellent restaurants, theatre, night clubs, Chicago's Magnificent Mile and Lake Michigan. The property was built in 1984 as a rental property and was converted to condominiums in 2005. Ontario Place is a pet friendly building consisting of 467 condominiums located on the 8th through 51st floors. Amenities include a 24-hour door staff, valet, business center, party room, outdoor pool and sundeck and a fitness room. There is a public garage with a total of 496 parking spaces and floors 5 through 9 house deeded parking spaces for the condominium residents. There is retail space located on the 1st floor which includes Chili's Restaurant, Seven Eleven, Banco Popular and Pink Berry Yogurt. There are a number of offices located in the commercial area of the building. The Residences at Ontario Place makes living in River North easy. Old Town Condominiums is located within Old Town Village....known as the 'walk-ups.' 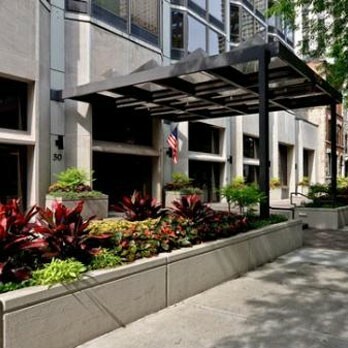 Convenient shopping and transporation makes this an enviable downtown location. 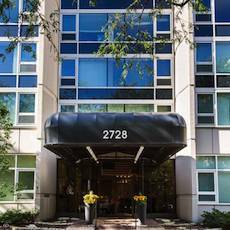 222 East Pearson is a desirable condominium building located in the heart of Chicago’s upbeat Streeterville neighborhood just steps away from Lake Shore Park, Michigan Avenue, and Lake Michigan. 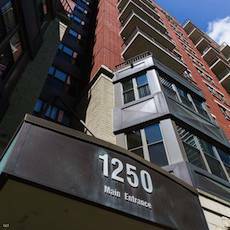 222 East Pearson stands 27-stories tall and is loaded with 220 spacious condominium spaces. Each condo has private balcony space to enjoy the beautiful lake and cityscape views. The building has a wide range of amenities including a rooftop terrace, party room, exercise facility, on-site valet parking and dry cleaning. This boutique building employs full-time door staff and on-site maintenance staff and management. Built in 1940 and converted to condominium lofts in 2008, McKinley Lofts consists of 163 residences comprised of 1, 2 and 3 bedroom units and deeded parking for 178 cars. Amenities include an exercise room, study, in-unitwaher and dryer, storage lockers and bicycle storage. Located directly across the street from a park, residents can enjoy swimming and other activities that the park offers. One hundred and forty four townhomes located at the heart of the South Loop in Dearborn Park 1. The community is a stone's throw from the Financial District and many fine restaurants, museums, the Shedd Aquarium, the Adler Planetarium & Astronomy Museum, Grant Park and the new Millennium Park. This pet friendly community is situated in the heart of the vibrant South Loop District. 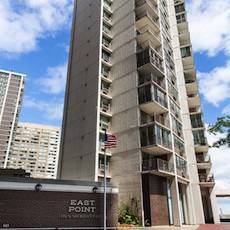 This great location makes living convenient for those that depend on public transportation and for those who need quick access by auto to Michigan Avenue, Lake Shore Drive, the Kennedy Expressway and the Eisenhower Expressway. A 65 unit modern brick building built in 1980 as part of the original Dearborn Park project. Originally built as apartments but sold as condominiums due to the high demand of this suburban style enclave located just blocks from the heart of Downtown. Located on the cul-de-sac in Dearborn Park, the quiet front yard and rear courtyard offer distance from the hustle and bustle of convenient thoroughfares nearby. The courtyard is available for parties as is a party room which was just redecorated. Owners in the building enjoy membership in the adjacent pool which is open from Memorial Day to Labor Day. There are 35 Association owned parking spaces in an underground garage which are available for rent on a first come first serve basis. The Metropolitan Mews Home Owners Association is a community of town homes located in energetic South Loop, Dearborn Park Two area! Nestled in a quiet neighborhood, adjacent to Cottontail Park the location is ideal for all ages. Proximity to Schools, shopping, parks and public transportation are just a few of the amenities this community has to offer. With its extraordinary architecture and design, prime location, breathtaking panoramic views, first-rate service and luxury amenities, the Grant on South Prairie Avenue is without a doubt one of Chicago's most coveted buildings to reside in. 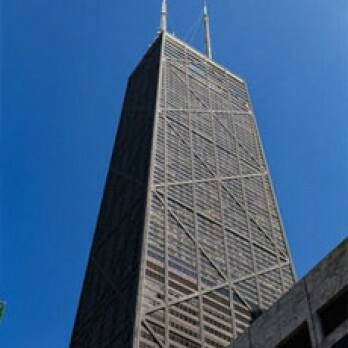 The building inherited its name from Grant Park (aka "Chicago's Front Yard") which is not only in close proximity, but also widely recognized as one of the most awe-inspiring and iconic public spaces in the city of Chicago. With the lakefront being just steps away, the building is also located on the doorstep of various cultural attractions, such as the renowned Museum Campus, lakefront harbors and biking/walking paths. At 51 stories high, the Grant is comprised of 298 units and boasts the following aforementioned luxury amenities: an exquisitely landscaped and spacious outdoor deck equipped with a catering kitchen and fireplace, as well as grilling stations which may be reserved for private parties; a fitness center located adjacent to an indoor pool and hot tub; his and her locker rooms equipped with saunas and offering easy access to nearby outdoor biking and walking paths; a top-rated concierge service; a pet-grooming area and dog run; deeded parking in a covered, heated garage; a dedicated play area for children; a theater screening room and lounge, as well as a spacious and fully-equipped bike room. Located in Chicago's hottest new neighborthood, this luxurious 15-story highrise houses 186 condominiums and 287 deeded parking spaces. Just 2 blocks away from the CTA, Prairie House at Central Station has a rooftop sundeck, hospitality room, bicycle room and storage lockers. Also, VIEWS, VIEWS, and more SPECACULAR VIEWS. The building is pet friendly and has a 24/7 staffed door station. Located in the heart of Central Station and Museum Park you will find Prairie District Tower Residences. Built in 2003, this 23-story tower at 1717 South Prairie houses 177 condominiums with unique spacious floor plans and covered deeded parking spaces. Amenities include 24-hour door staff, complete fitness center with a dry sauna, dry cleaner, media room, meeting room, wine storage, storage lockers and a gated dog run. Private balconies and views of Lake Michigan, the City, and Soldiers Field. Located in Chicago's South Loop -- one of the city's fastest growing neighborhoods -- Museum Park is within walking distance of the Loop, Museum Campus, and Grant Park. Among its neighbors are the Field Museum, the Adler Planetarium, the Art Institute, Soldier Field, Millennium Park, and Chicago's magnificent lakefront. Although the neighborhood is still growing, several upscale dining options are available and more are on the way. Museum Park Tower I is a twenty-story high rise comprised of 221 one- and two-bedroom condominiums and 257 indoor, deeded parking spaces. All units have private balconies. Each unit has a storage space and access to indoor bike rooms and racks. There is a well-equipped fitness center on the penthouse floor, housing much of the finest equipment found in professional health clubs. The building is pet-friendly. A friendly and well-trained door staff provides security, a warm welcome for guests, and 24-hour concierge services. Museum Park Tower I is a member of the Museum Park East Umbrella Association and as such its owners and residents have access to the umbrella clubhouse, a four-story facility that houses a market and dry cleaner, an outdoor swimming pool and wading pool, a clubhouse for relaxation with family and friends, and a party room that can be rented for private parties and celebrations. 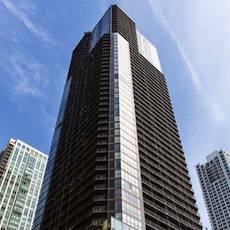 The Residences at The Joffrey Tower is a luxury condominium development consisting of 184 units and is located in the heart of Chicago's Theatre District, close to many cultural events and shopping opportunities. The 24 stories of condominium units consist of one and two-bedrooms offering breathtaking views of Chicago and Lake Michigan. The Joffrey Ballet shares the ground floor with retail space and the Association. The luminous glass exterior made in China and assembled in Singapore was designed by Chicago architect Laurence Booth. In keeping with Chicago's trend to make the city environmentally friendly, the Association maintains a green roof on the 5th floor. Owners and residents enjoy on-site management, a fitness facility, recreation room and parking garage. The units are well arranged, with an eye towards maximizing natural light, attracting the sophisticated urban resident. Floor to ceiling windows, modern finishes and inset balconies are a few of the amenities the unit owners enjoy. 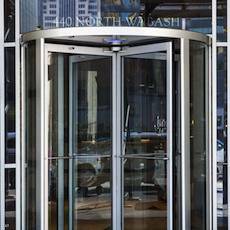 Residents and guests utilize a private entrance with dedicated elevators for the Association. The building is a welcome addition to this exciting Chicago neighborhood. Ritchie Tower consists of 28 stories with 105 condominium units. There is a 1/3 acre landscaped pool deck with a heated outdoor swimming pool, gas grills, 2 gazebos. The fitness center was renovated in 2002 and the laundry facilities were renovated in 2003. This is a pet friendly property with an indoor parking facility. Nestled in a block long Gold Coast pocket, Ritchie Court Private Residences is within walking distance to the Magnificent Mile and Lincoln Park Zoo, offering fabulous views of lakefront sunrises and urban sunsets. 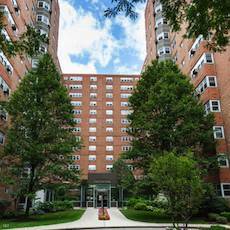 Built in 1972 and converted to condominiums in 1993, Ritchie Court has 148 units, many combined into luxurious homes, along with deeded parking. Ritchie Court is a full amenity building with 24 hour doorman, ample maintenance staff,with an engineer on premise, on-site management, state of the art exercise room, laundry room, hospitality suite and outdoor pool. 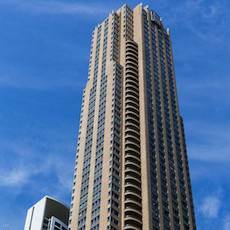 1 East Schiller is a 23-story high rise condo building in Chicago’s sensational Gold Coast neighborhood. 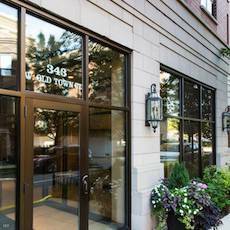 Located just 2 blocks off Lake Michigan, 1 East Schiller Condominium is the perfect place for dog owners who love walking and jogging down the many tree-lined streets scattered throughout Chicago’s Gold Coast area. 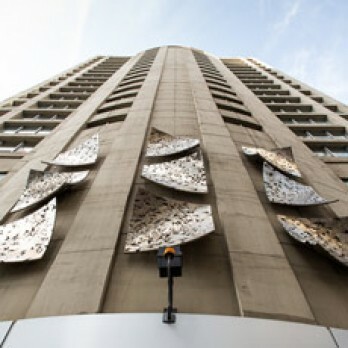 The building was originally built in 1964 and houses 78 condos that range from one to three bedrooms. Amenities include on-site management office, 24/7 door staff, 24/7 garage attendants, on-site valet service, and a laundry facility. Old Town Condominiums is located within Old Town Village....known as the 'walk-ups.' Convenient shopping and transportation makes this an enviable downtown location. 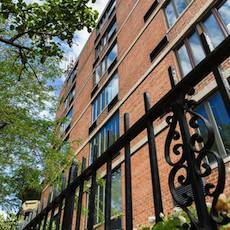 2007 N. Sedgwick Condominium Association is a 42 unit brick building located in a premier section of Lincoln Park. The roof top deck is a gathering place for the residents of the building. Some units have private balconies and deeded garage parking. 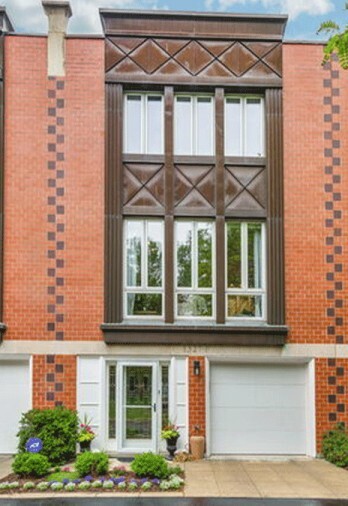 Access to the zoo, Gold Coast, Loop and entertainment make this a truly exceptional location. This is one of the gems of the North Shore. 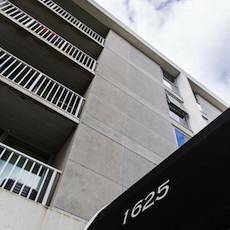 56 residential and 13 commercial units make up the 1625 Sheridan House Condominium Association. The exterior of the building was completely renovated at a cost of 1.5 million dollars in the year 2000. Renovating all five floors of the residential portion of the building was completed in 2003. Located next to the popular Plaza De Lago and views of the lake make this a truly unique location. Whether it's a jog along the Lake, a bike ride to Navy Pier or a view of Chicago's magnificent skyline, Hollywood Towers is perfectly situated on the Lake in North Lincoln Park where the Outer Drive or CTA can get you downtown in just minutes. In every respect, Hollywood Towers offers the best of everything Chicago has to offer, yet caters to anyone's need for solitude, amenities and the pure enjoyment of city living. Located at the top of Outer Lake Shore Drive, directly overlooking Lake Michigan, 5701 North Sheridan Road comprises two 30-story towers with 541 spacious condos, ranging from studios to luxurious 3-Bedroom units. Amidst over 70,000 square feet of immaculate common area space, the amenities range from on-site Food Mart and Dry Cleaners, and Travel Agency, to a Hair and Body Salon. You'll also find an Exercise facility, Bike Room , 24-Hour Front Desk and Maintenance Staff, and a fully-staffed, On-Site Management Office. And that's not all. At Hollywood Towers, you'll find heated indoor parking, and a magnificent pool deck on the 2nd Floor level which hovers above the rich greenery and white sands of Hollywood Beach. Food deliveries arrive daily from a wide variety of restaurants, and you'll have close proximity to all of your living needs, including public transit stops which are virtually right outside your door! An active, vigilant Board of Directors works hand in hand with Management to assure the highest housekeeping standards, while the primary focus is on impeccable maintenance, strong financial management and planned maintenance and replacement of all integral components of the twin-tower infrastructure. In every respect, Hollywood Towers is a model Condominium living environment which offers exceptional value in city living. Malibu East’s 45 stories and 498 residential units, 12 units per floor (1-3BR, 9-2BR and 2-1BR), stands on the corner of Sheridan Road and Glenlake Avenue on the water’s edge of Lake Michigan and provides its owners with one of the most magnificent panoramic views of the lake and skyline to be found anywhere in Chicago. There is a map on the left. 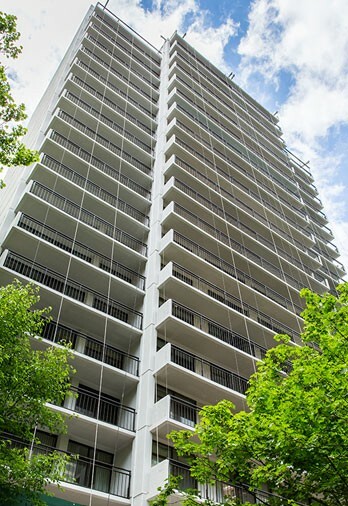 El Lago was constructed in 1959 and consists of 268 one and two bedroom condominium units located on 25 floors. The back door literally opens onto Lake Michigan. The building provides both indoor and outdoor parking, 24 hour door staff, roof sundeck with attached hospitality room, bike and storage locker facilities. A full-time, on-site property manager is there to assist the residents. Prairie Court is an exquisite new luxury townhouse community set right in the middle of Chicago’s ever-evolving South Loop neighborhood. Located near Prairie Avenue and 17th Street, makes the Location very desirable for professionals and families. The townhomes in this new community are settled directly in between all the towering high-rises, lofts, and historic mansions that fill out the South Loop real estate landscape, but in a way that still provides residents with plenty of privacy and a unique and highly desirable sense of community. The luxury townhouses at Prairie Court allows owners to fully enjoy the sights and sounds that coincide with living in downtown Chicago. Plenty of shopping, dining, entertainment, and outdoor recreations are nearby given the development’s close proximity to the lakefront. 1255 N. State Parkway, better known as “The Churchill” was built in 1927 and consists of 64 units ranging from one to three bedrooms. Amenities include full time engineer, 24/7 door staff, sundeck, laundry room, bike rooms, receiving room, cable TV and storage lockers. 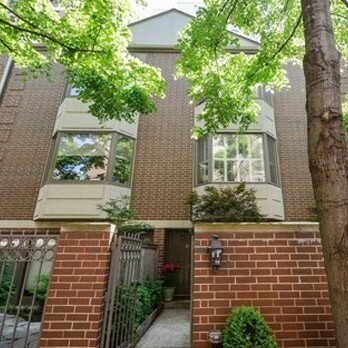 Located in the Gold Coast and is within walking distance to Lincoln Park, Lake Michigan and Lincoln Park Zoo. 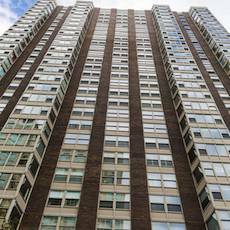 The 1400 State Parkway Condominium Association is an 18-story high rise development comprised of 96 one and two bedroom homes. There are 58 deeded parking spaces both above ground and below grade in a parking garage. All apartments have private balconies, storage lockers and access to bike racks. The on-site property manger acts as the doormen during business hours; security guards provide protection and door access overnight and on the weekends. This pet friendly provides views of the beautiful Gold Coast neighborhood from every apartment. This cooperative was built in 1928 and consists of 12 units in a fifteen-story building. 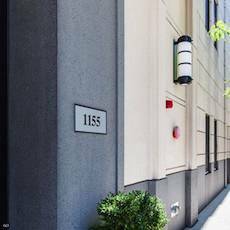 Amenities include full time on-site engineer, 24-hour doormen, indoor garage, outdoor parking, bicycle room, cable TV and large individual storage rooms. Located in the Gold Coast and is within walking distance to Lincoln Park Zoo, Lake Michigan and Lincoln Park Zoo. 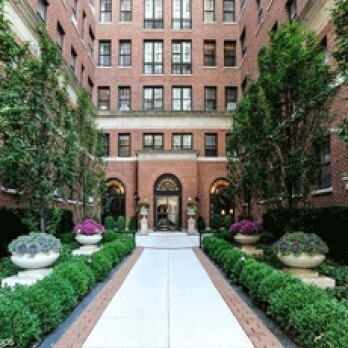 1550 State Parkway was built in 1911; this prestigious and intimate building was converted to condominiums in 1977. The location is ideal and there is direct access to the park and lake front. With a total number of 33 spacious units accessing 10 stories, this building has Benjamin Marshall's unique architectural style and is often referred to as the wedding cake building. Parking is available next door at the Constellation. Building amenities include a 24 hour doorstaff, exercise room, rooftop sun deck and live-in engineer. 1 dog allowed up to 25lbs ok.. 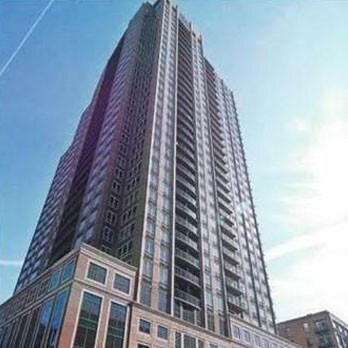 This spectacular 171 unit condominium property was constructed in 1999-2000 and is located in one of the most desirable locations in the City of Chicago. Amenities include an indoor deeded parking facility, valet shop, on-site management office, 24-hour door staff, in-unit washers and dryers, an exercise room, hospitality room, bicycle storage, and storage lockers. In addition, every unit has a balcony. Restaurants, theater, nightclubs, Chicago's Magnificent Mile, and Lake Michigan are only a stone's throw from this exciting address. This is the place to live, work, and play. Newberry Plaza, 1030 N. State Street, is located in the heart of the Gold Coast. This 52-story building provides stunning lake, skyline and sunset views. Units on floors 1-39 have private balconies. Amenities include 24/7 door staff and maintenance staff, large outdoor pool with sundeck, on-site management office, exercise room, hospitality room, receiving room, storage units on each residential floor, on-site dry cleaners, attached parking garage, and heat and air conditioning included in assessments. Cats are welcome. In-unit washers and dryers are allowed. 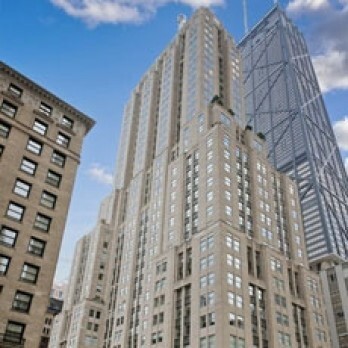 Close to Magnificent Mile shopping, world-class restaurants, Oak Street beach, and bus, train and taxi transportation. In the crowded field of residential high-rises on Chicago's Gold Coast, the Ambassador House differentiates itself as a fashionable, very well-constructed building with unusually spacious units. 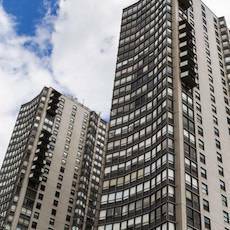 Located at 1325 N. State Parkway and built in 1965, the 24-story high-rise houses 112 luxury condominium units and a heated public parking facility. In 2011, the building completed the city-mandated life-safety communications installation well ahead of the deadline. 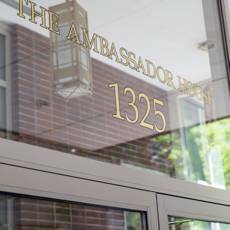 Ambassador House condominium homes have large rooms, high ceilings and modern amenities, including on-demand cable service. The building has a beautiful grand lobby and tasteful hallways, renovated in 2012. The popular rooftop pool and sundeck provide panoramic lake and city views. 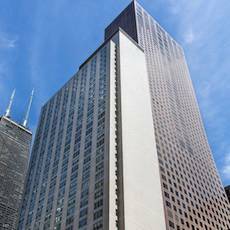 On-site management and a 24-hour door staff are valued services at this exquisite and convenient location, just a short stroll to the Magnificent Mile and Lake Shore Drive and minutes to Chicago's "Loop." 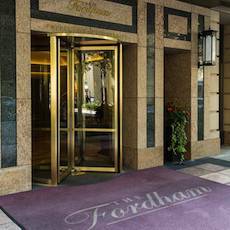 The Fordham is a 50-story luxury high-rise with 268 residences and is located on the south side of Superior between State Street and Wabash. Amenities include a Fitness Center featuring an indoor pool, hot tub, sauna and massage rooms. 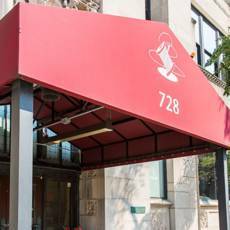 In addition to service orientated management and staff, the Fordham also offers a parking garage with assigned spaces, a Dog Run and a Dry Cleaner/Receiving Room. Other features include a Theater Room, Entertainment/Hospitality Suite, Library Lounge, Humidor Room, and Wine Cellar. The Residences at 235 W. Van Buren is a modern style residential high rise, located just steps away from the Loop's financial district and Willis Tower. Features of this 714 unit, 46 story condominium tower include 500 parking spaces, a grocery market, cleaners and a high end men?? ?s salon. Residents enjoy the luxury of an onsite management team, professional 24/7 security staff and a dedicated maintenance crew. With easy access to Grant Park, the Chicago river and lakefront 235 W. Van Buren is in walking distance to a variety retail shopping and fine dining. Situated in River North along the Chicago River, The Renelle is an ultra-luxe property consisting of 45 condominiums, ranging in size from three to four bedrooms featuring refined fixtures and material finishes, private outdoor terraces, custom tailored floor plans, and expansive river and city views. 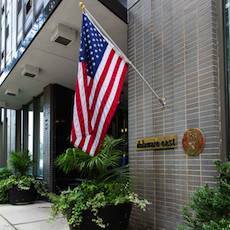 Amenities include 24-hour door staff, maintenance staff, a fitness center with yoga room, outdoor dog run, private rooftop lounge with indoor and outdoor kitchens, outdoor terrace with fireplace, private screening room, and game room. 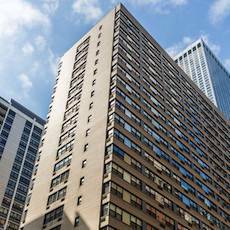 Plaza 440 is perfectly located near the Chicago River on Wabash Avenue. 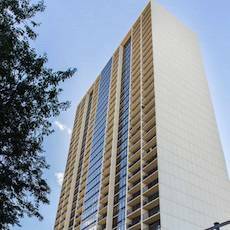 Built in 1991 at 50 stories with 457 luxury apartments, and converted toprivate residences in 2005, Plaza 440 is a full-amenity building with a health club, sundeck, swimming pool, club/theatre suite, business center, valet/dry cleaner, deeded parking and more. 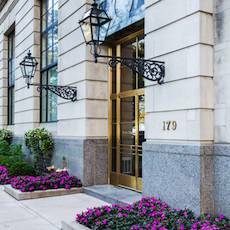 Chicago's world-class amenities await you, and begin at our door step. 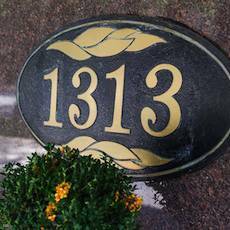 Located in the heart of the burgeoning South Loop neighborhood you will find 1111 S. Wabash Condominium Association. It is a 34-story 247 unit luxury condominium building featuring spectacular views of the downtown skyline and the museum campus, as well as panoramas of Lake Michigan. Amenities include a swimming pool, fitness room, hospitality room and a business center. Service includes a 24-hour door staff, maintenance staff and onsite management. Situated in the historic Gold Coast, No. 9 West Walton is a 2018 ultra-luxury property consisting of 72 condominium homes, ranging in size from two to five bedrooms featuring the highest quality finishes, large private terraces, 10-12 foot ceilings and custom tailored floor plans. Amenities include a fully staffed door and maintenance team, valet parking, a club quality work-out facility with an indoor lap pool, a private dining room, a house car and driver, private wine storage cellar, covered dog run and two guest suites. The Palmolive Building, designed by Holabird & Root, one of Chicago’s oldest and most prestigious architectural firms, was completed in 1929 as a commercial office building and headquarters of the Colgate-Palmolive company. It is one of the most widely recognized examples of Art Deco architecture in the world. The building is a Chicago Landmark, listed on the National Register of Historic Places and its façade is a protected easement of Landmarks Illinois – all to insure that the building maintains its prominence for the next centuries to come. The building was converted to luxury condominiums in 2003-2005 with a full renovation of the infrastructure and rehab of the limestone and terra cotta façade. 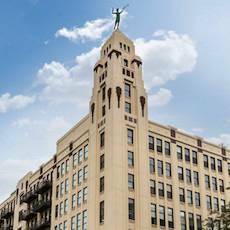 Today, the historic Palmolive Building is home to 98 luxury homes located within the 37 story Art Deco structure. The building’s set-backs now feature private terraces for the adjacent homes. Residents enjoy hotel style service and 24 hour door staff, valet garage and maintenance staff. Amenities include a fitness room, whirlpool and sauna spa, Beacon Club entertainment/meeting room, electronic security systems in all common areas, on-site Concierge and full time management staff. 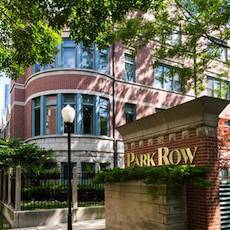 This gem tucked away on a quiet tree-lined street in Streeterville is one block from Chicago's Magnificent Mile. 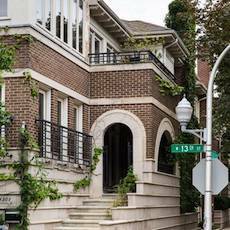 The property consists of 19 condominium units and is one of the best kept and prettiest smaller vintage properties in Streeterville. One of Chicago's most unique intimate 22-story gems. Two homes per floor. 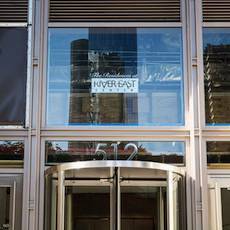 Tucked away in the heart of Streeterville, the property is one minute away from Chicago's Michigan Avenue and Magnificant Mile shops, thearters, and restaurants. This beautifully constructed modern building is situated in the newly developed Lakeshore East neighborhood. Consisting of 44 stories and boasting excellent pool and fitness facilities, The Regatta also hails as a pet friendly environment. Surrounded by Lake Michigan, Navy Pier, a 6 acre botanical park, and Millenium Park, The Regatta represents contemporary urban living at its finest. 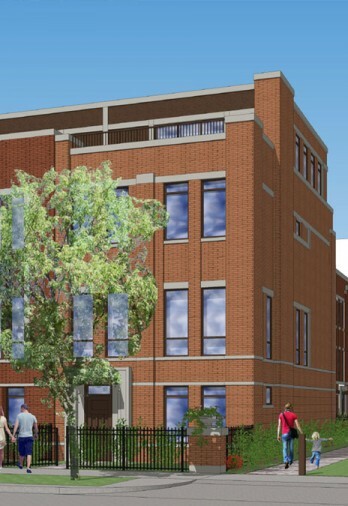 Located in one of Lincoln Park’s most desirable communities, Webster Square is a luxury condominium redevelopment of the former Lincoln Park Hospital. This 87 unit luxury condominium will be opening Spring of 2017 and offers residents the upscale services of a full-amenity high-rise building. High-end amenities for the Association include a fitness center, residents lounge, 24-hour doorman, on-site manager, heated indoor parking, private landscaped ½-acre courtyard, and rooftop sundeck with stunning views of Lincoln Park, Lake Michigan and the city’s skyline. 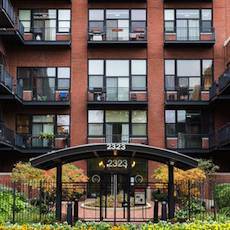 Americana Towers Condominium Association is comprised of 420 condominium units on 33 floors in Chicago's old town neighborhood. 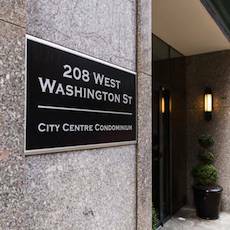 Amenities include indoor and outdoor parking, an outdoor swimming pool and sundeck area, exercise room, party room, laundry room, receiving room and 24 hour doorman. One bedroom and two bedroom apartments facing east have balconies. New thermal pane windows and sliding doors were installed in all units in 2000. There are studio, one bedroom and two bedroom units at Americana Towers. 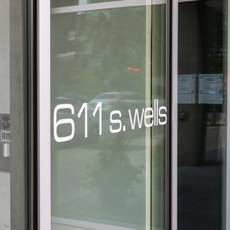 Located in Chicago's Printer's Row/South Loop area, the 611 S. Wells Street Condominium Association, otherwise known as The Vetro, is the area's newest addition in luxury living. 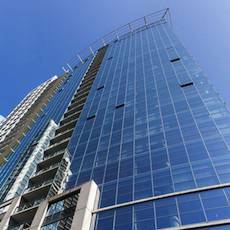 The distinctive blue tinted exterior glass windows run floor to ceiling in this 31 story high rise. 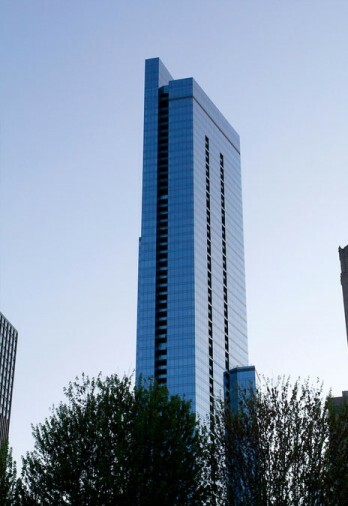 Vetro is Italian for glass and the combination of glass, steel and concrete make for a modern building that fits well into Chicago's renowned architecture. Construction of this 232 units was completed in 2008 and the building offers 24/7 door-staff service, a full time on-site manager, deeded indoor parking, bicycle storage, a fitness center, balconies, community/multi media room, steam rooms, showers, spa-whirlpools, massage room, storage lockers, and a sundeck. Pet are welcomed in the studios, one, two and three bedroom units that range from 500 to 2,000 square feet and have 9 foot glass ceilings and windows (11 feet in the 10 penthouse units). 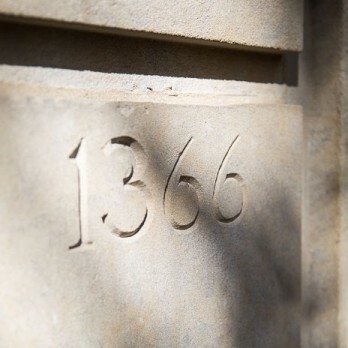 The City's renowned Printer's Row neighborhood, with its history and unique vibe is just steps away from the Vetro's front door. Relax watching city and waterfront views from your balcony, loosen up in the jacuzzi and enjoy one of Chicago's best neighborhoods at 611 S. Wells. Modern in design and classic in appeal, The Lancaster, built in 2004, is situated in the newly developed Lakeshore East neighborhood. 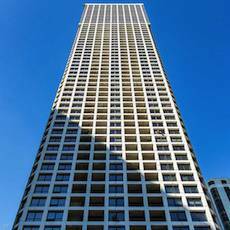 This 29 story condominium tower overlooks Lake Michigan, Navy Pier, the Chicago River and a six acre botanical park. The Lancaster provides a small village-like atmosphere and is within walking distance to Millennium Park, museums, the theatre district and the Magnificent Mile. The Lancaster represents urban contemporary living at its best. The Willows of Lincoln Park is a 32-unit Townhouse Association. All units have garage parking and three levels of living space. Located near the downtown area with a feel of the suburbs with the illusion created by an extensive courtyard that all owners can access through their back patios. Lush trees and landscaping make this area ideal for association gatherings or individual parties. Terra Cotta Commons built in 1930 and converted to condominiums in 1990 consists of 40 prestigious lofts and is located in one of Lincoln Park's finest neighborhoods. The units consist of 1, 2, and 3 bedroom floor plans, which include outside parking and rooftop decks. Close to many restaurants and nightlife makes this an ideal location for the active professional.